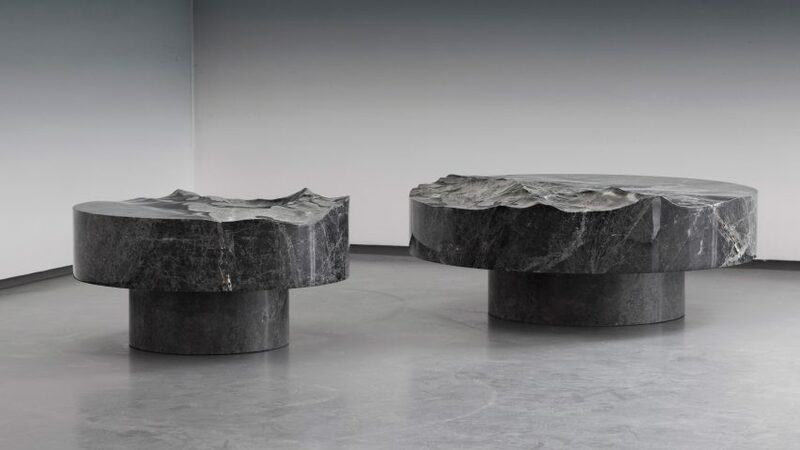 Mathieu Lehanneur chipped blocks of marble and bronze to create tables, benches and stools that resemble the surface of the ocean. Called Ocean Memories, the collection was created for an exhibition currently on show at the Carpenters Workshop Gallery in Paris. The pieces are created by using 3D special effects software – usually employed by the film industry – to translate ocean currents into digital forms. Blocks of stone are then machine-cut to replicate the digitally created forms, before being hand polished to create a glossy, liquid-like finish. At Carpenter's Workshop Gallery, Lehanneur has used the technique to create monolithic tables, benches and stools in white and grey marble, as well as polished bronze. "Ocean Memories evokes a surrealistic and materialised vision of an ocean frozen in its movement," said the gallery in a statement. "These remarkable pieces capture the complex movements of waves and water currents becoming three-dimensional still pictures of Nature’s fifth element." Lehanneur added: "The transition from solid to liquid can only come from the magic of physics. A moment of tilting from static to movement, a passage from the inert to the animated." The pieces build on the French designer's Liquid Marble series, which he debuted in 2013 at Milan design week with Turkish Stones. The original floor-based installation was made from black marble and was intended to mimic the rippling effect of the River Loire. Since then Lehanneur has created a similar rippling pool made from green Guatemala marble for an installation at a French chateau, and sculpted blocks of black marble to look like the sea for an installation at the V&A museum. He also used the technique to sculpt aluminium into convincing waves that sit at the base of glass tables for a show that took place in 2016 at Carpenters Workshop Gallery's London outpost. Ocean Memories is on show at Carpenters Workshop Gallery until 22 June 2018.